All you crazy cricket fans the God of cricket has finally joined Facebook. This is immediately after the God of Bollywood Big B joined Facebook. Indian celebrities are realizing the importance of Facebook and stared joining Facebook to promote themselves. Sachin Tendulkar joined Facebook to connect with his millions of Fans and his Fanpage is managed by a little known company called Seven3Rockers which is a Technologies mobile VAS company with a vision to transition consumers from Mobile VAS to Mobile Media engaged in promoting Cricket Celebrity. They are also involved with few IPL teams. Sachin Tendulkar popularly know as Tendlya has a very informative Fanpage and its timeline feature has been utilized very effectively. Most of Sachin Tendulkar's milestones are updated on this fanpage and users can simply click on a particular year and see the most memorable moment in Tendulkar's life in that year. Sachin had also joined twitter and has million of Twitter followers but he rarely finds time to tweet so its probably good idea to allow a professional team to handle his fanpage and he can easily focus on cricket. His Fanpage already has half a million fans while this article was being written. 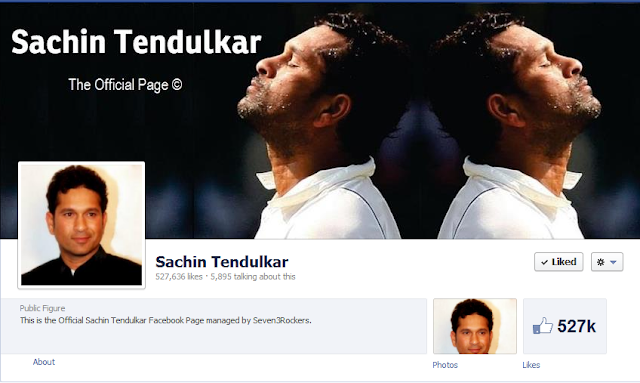 Here is Sachin Tendulkar's official Fan Page http://www.facebook.com/SachinTendulkar. So what are you waiting for just visit and become a Fan.